Our congregation has given considerable thought to who we are and where we are as a community in relation to our Shabbat services. We wish to make our Shabbat services joyful experiences for everyone. Several years ago we began our “2nd Shabbat” and “4th Friday” Shabbat services. On these evenings our community joins together in the rotunda at 6:00pm for wine and cheese, juice and cookies and social time. At 6:30 pm we gather in the sanctuary or chapel for a musical Shabbat service. The time of the service allows those with small children to join us following a quick dinner at home and those who have more scheduling flexibility to have a leisurely dinner with family or friends following the service. The “2nd Shabbat” service is accompanied by Tsimmis, Oak Park Temple’s acoustic band. Worship is enhanced using both contemporary Jewish music and traditional melodies played on mandolin, guitar, keyboard, bass and acoustic percussion. The “4th Friday” Shabbat service is accompanied by classical guitarist Aaron Burnstein. 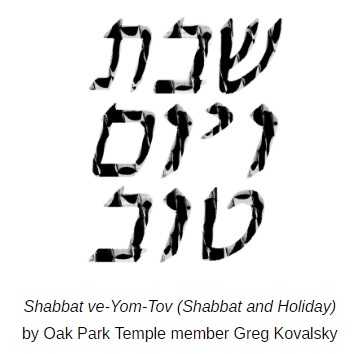 Contemporary and traditional melodies are used during the 4th Friday Shabbat Services. Rabbi Weiss and Cantor Green lead the Friday night Ma’ariv Shabbat services at 8 pm on the 1st, 3rd (and sometimes 5th) Fridays of the month. Throughout the year, families with small children are invited to Tot Shabbat, an abbreviated service on Friday night or Saturday morning where children can sing songs and hear stories from our rabbi or cantor. Shabbat and other Jewish holidays allow us private time for reflection, time for joyful communal singing, moments of restfulness and moments of exaltation.